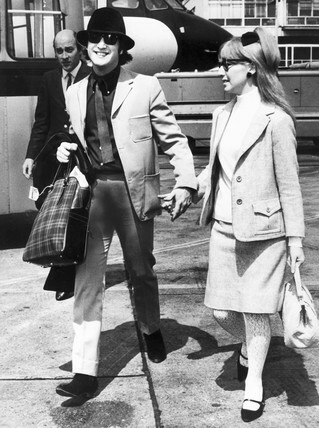 John Lennon (1940-1980) and his first wife Cynthia Powell (1939-) on their way to the Cannes Film Festival. Lennon formed the Beatles in 1960 with Paul McCartney (1942-), George Harrison (1943-2001) and Ringo Starr (1940-). Before being signed to Parlophone in 1962 The Beatles were found playing in the Cavern Club in Liverpool and venues in Hamburg, Germany. They went on to become the most successful pop group of all time and finally split in 1970. 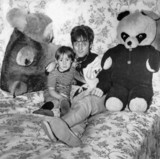 John and Cynthia had one child together, Julian (1963-). Following his divorce from Cynthia in 1968 Lennon married the Japanese avant-garde artist Yoko Ono in March 1969. The Beatles finally split in 1970. Lennon was murdered in New York on 8 December 1980 by Mark Chapman.